In numerical order off the list we rolled up our sleeves and put our big boy pants on (don't drink without pants) and set about getting the scoop. We had started at the top and these are the second four... Here is a link to the First Four. 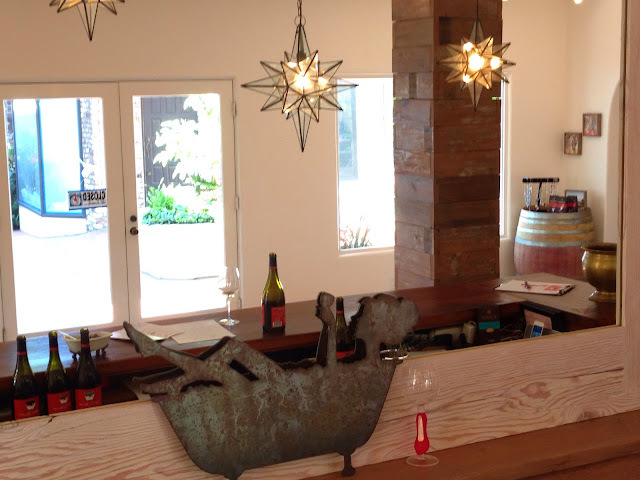 As one enters this lovely tasting room it becomes quickly obvious that Alan Silvestri not only makes great wine but also makes wonderful music. Turning film from just a visual art form into an emotional one through music. His filmography which is shown on a screen in the tasting room is just awe inspiring. Planted in 2000 and the first vintage in 2003 the vineyards are located approximately 15 miles from the Pacific Ocean up Carmel Valley. This location is the key element in the terroir of this unique site. 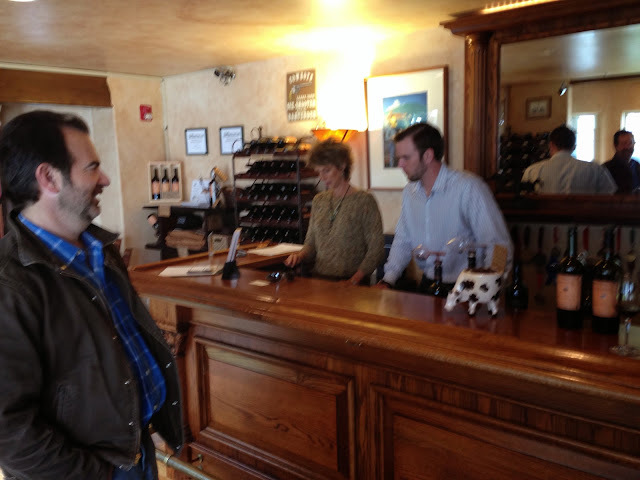 Alan likens the winemaking style to the classic French wine farm tradition. This involves labor intensive hands on techniques such as 100% barrel fermentation for the Chardonnay and small open topped fermentors for the red varieties. They try to use traditional methods to allow the expression of the terroir while taking advantage of modern knowledge about wine fermentation and aging. 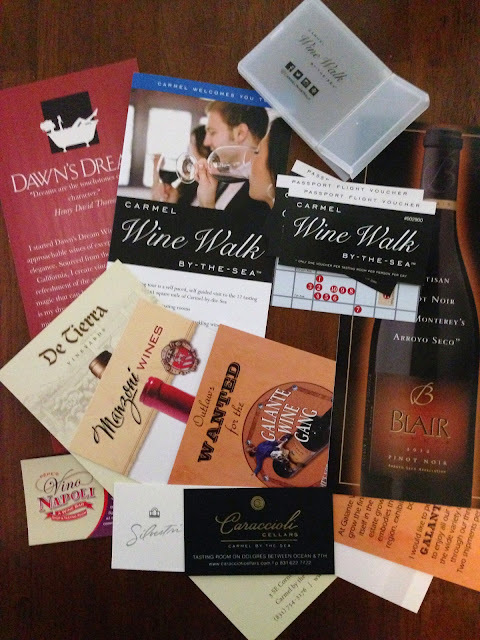 With your passport you get to choose four of the seven lovely wines off their list of estate wines. Dawns is the new tasting room in town having only recently moved in from the Valley. 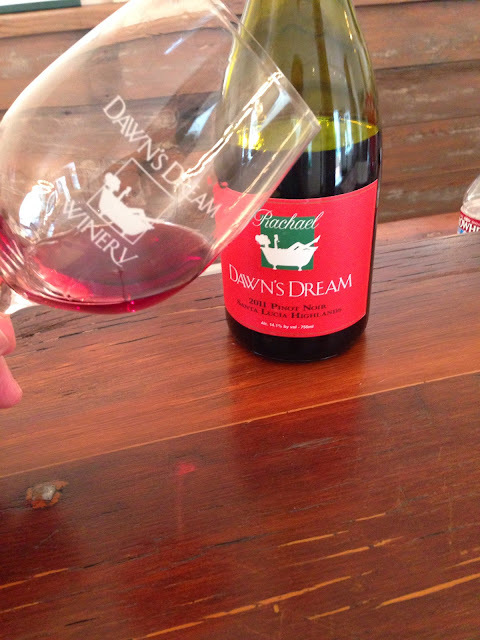 Located behind the building on the NW Corner of 7th & San Carlos the Dawns Dream Winery tasting room is spacious and inviting. You can even take your picture in the iconic bath tub that features on the wine labels. 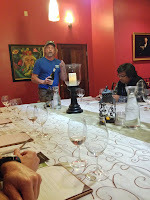 Our tasting started off with Dawns lovely Chardonnay and then a Pinot Noir Rose and we never looked back. Next up there is the three Daughters. Dawn has named her wonderful Pinot Noir's after her three daughters. With all three having different personalities but all so lovely it is hard to find a clear favorite (talking about the wine, stay focused). Although only producing for five years Dawn has a very experienced wine maker crafting her wines and this shows clearly with awards stacking up fast. In fact every pinot they poured was awarded a gold in the Pinot Noir Summit and all Medaled at the San Francisco Wine Competition. We also found out they do a lovely cheese platter to keep your hunger at bay. 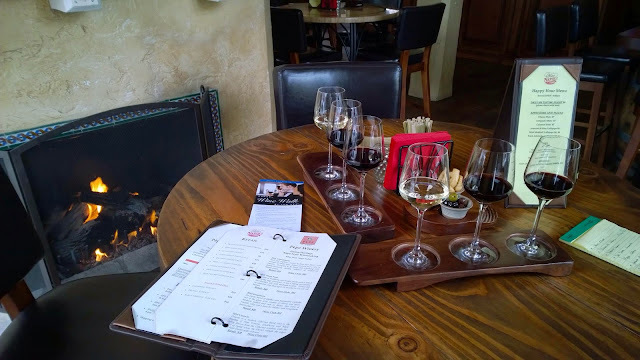 With such a lovely setting and feel as well as many award winning wines this is a great choice for a stop on the Carmel Wine Walk by-the-Sea. 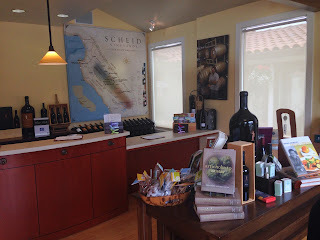 Located just a block off of Ocean Avenue on the corner of San Carlos & 7th, this roomy Carmel Tasting Room has a nice inviting feel to taste an array of Scheid Vineyards wines. 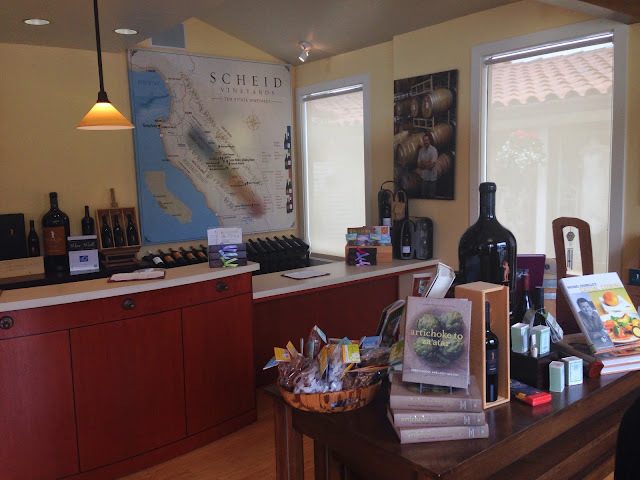 Scheid not only makes wine for their own labels but also for Napa and Paso Robles wineries labels as well. They change up the tasting flights every month so there is always something new to taste. 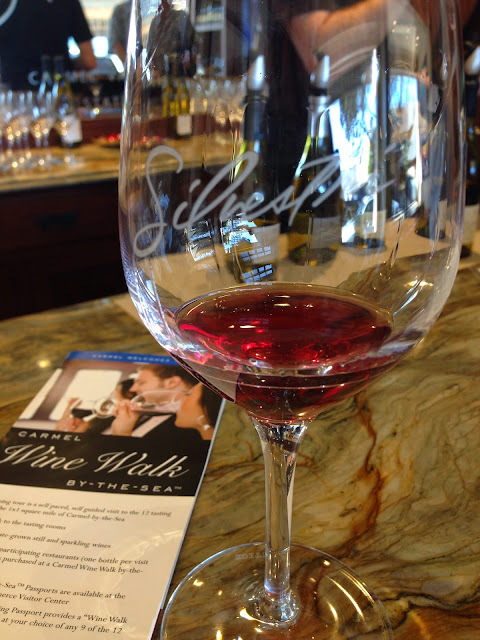 For just a few dollars more you can upgrade your Carmel Wine Walk by-the-Sea passport to a Reserve tasting. The 2010 Reserve Cabernet Sauvignon alone may be worth the extra. You can also mix up your passport tasting to just whites or just reds giving great flexibility to create your own tasting. So head on in for the Estate flight of four Estate wines that show the diversity of Monterey. 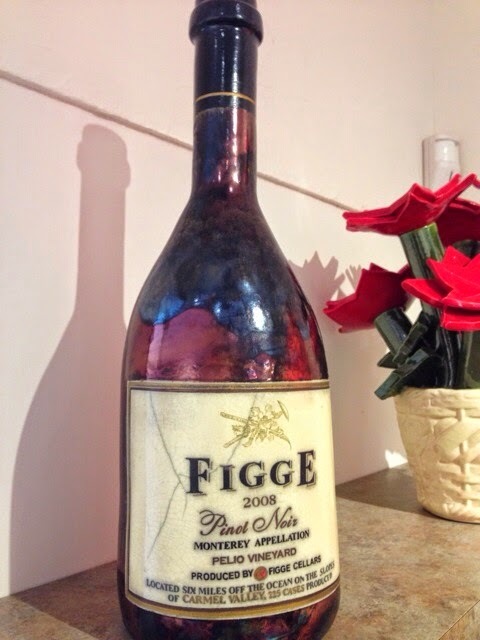 The business, as it is today, began in 1990 when the family converted six acres of land to vine rootstock. In 1999, with the planting of imported clones, the Manzoni Family turned their family tradition into a full-time passion. As Mark Manzoni told us, "They believe that their stewardship of the land, their purposefully small yields, and their detailed attention to every aspect of production results in a more flavorful, better tasting selection to grace your table." Producing just 300 cases these are truly small production wines. Because their production is so small they can pick at the exact moment the small vineyard is ready and not worry about a big difference in ripeness like in larger vineyards. 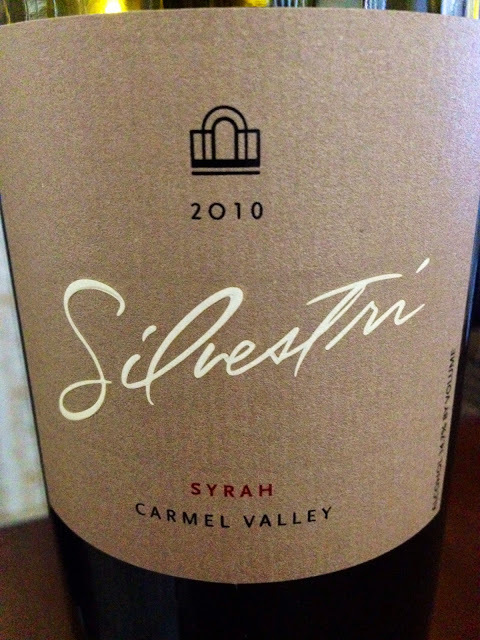 With judicious use of new French oak these wines are subtle yet full flavored and are well worth trying. 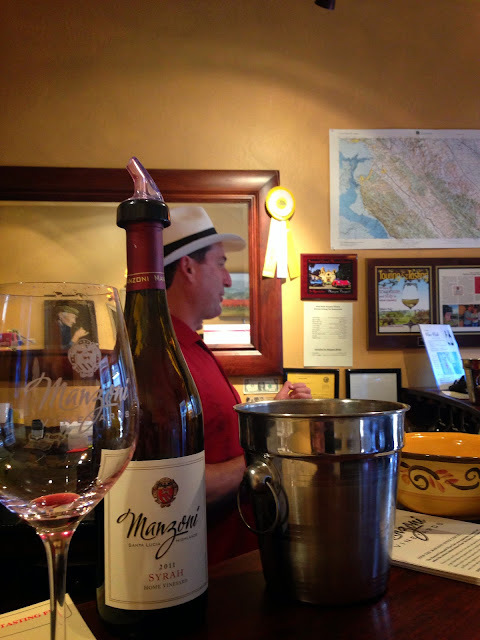 This quaint little tasting room allows for the perfect spot to enjoy these wonderful wines in an intimate setting that often allows you to have your wine poured by and talk with Mark Manzoni himself. Located on San Carlos between Ocean and 7th in the Paseo Courtyard. 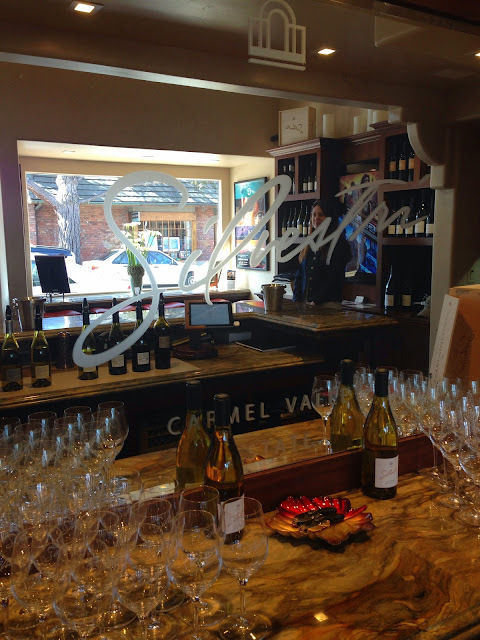 Another group worthy of your tasting choice! 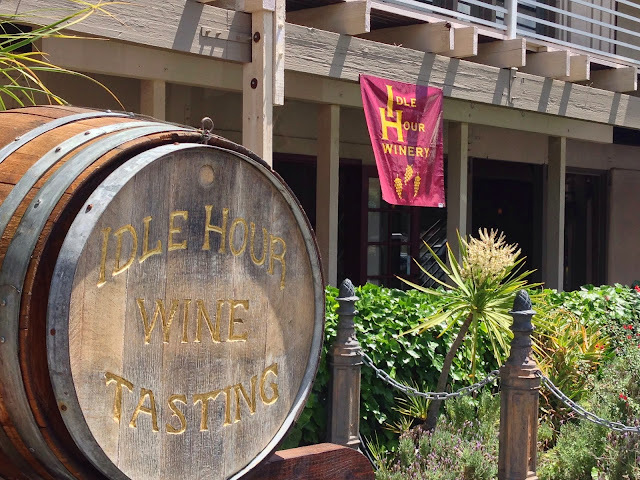 Summer's Top Secret Wine tasting trips in California. Summer is fast approaching here in California, and going wine tasting is a great way to enjoy those great weather days. There are a number of great areas to go here in California, and we have covered some and will be covering more as soon as we can. We will focus on a couple of the less well known areas first. 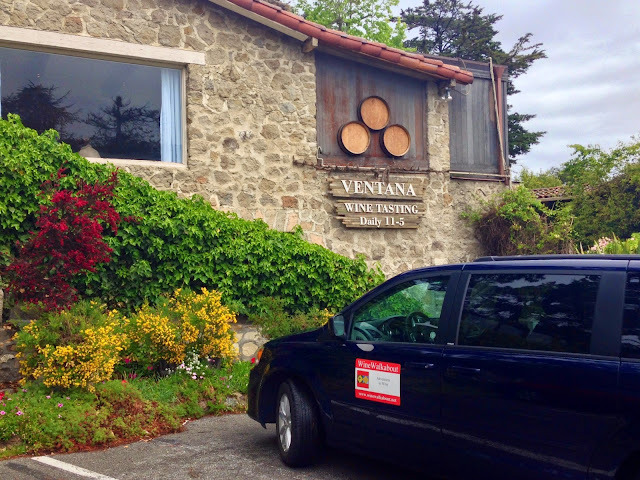 You may be the first of the wine ponce group, to plan a trip to one of these not as famous areas, once you find out what is to be experienced. Some folks find the thought of going wine tasting both exciting and intimidating at the same time. Given the strange language that is often used and odd behaviour so we see how this could be. But not to worry as there really is nothing to be intimidated by. Your money is as good as anyones. 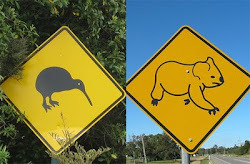 So plan a trip with a mate or friends and just have a good time. Nothing to be concerned about except too much fun. Read THIS to help you get started. These are a number of places to get started. So stay tuned as we type up a storm and get you started planning a trip as soon as possible. 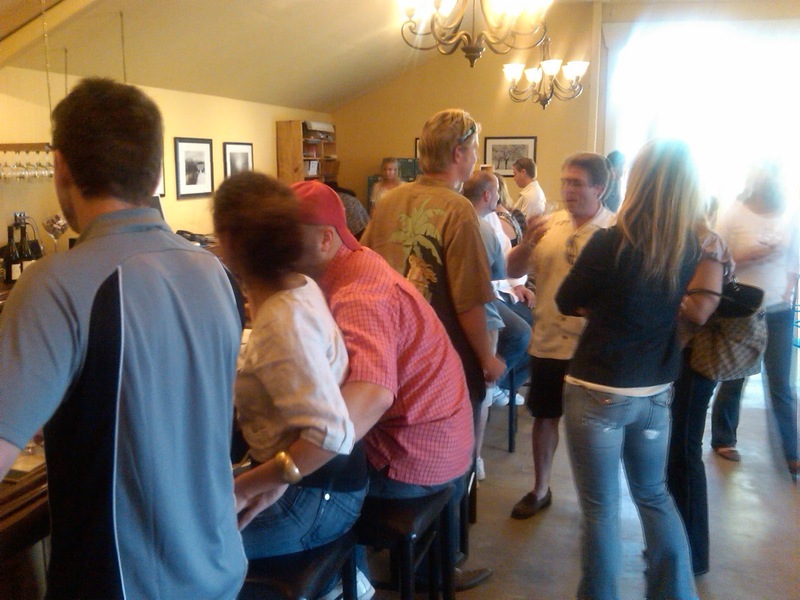 1st one is River Road Wine Trail in Monterey County California. Like sand through an hour glass these are the days of the vines. Last we left you in the vineyard we were pruning. Ok, we were not pruning but we were watching, listening, and learning. As we have said the work in the vineyard never stops. Since then we have been bottling and now it’s back out to the vineyard to see what’s going on. 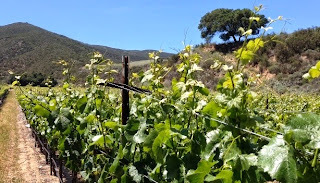 It is now a couple weeks into May here in California and we have met up with Mark Pisoni of Pisoni Vineyards at their beautiful Santa Lucia Highlands vineyard in Monterey California. Currently the vines are growing like weeds and we are in the middle of flowering. These little future bunches of grapes are some of what will end up in your glass. As the vines grow the grape clusters go through set and then veraison. Veraison is when the grapes begin changing color and softening- it is the onset of ripening. It is then that the careful selection of the bunch’s to keep and the ones to drop will be made. But we are getting ahead of ourselves. Each region, each vineyard and each variety has its own needs and the way the vines are treated to grow the best grapes for any given area have differences. With that in mind Mark Pisoni was gracious enough to tell us about what is currently going on in his family's famous Pinot Noir vineyards. Early spring brings the period we call “great growth” in the vineyard, because the new shoots grow like gangbusters. 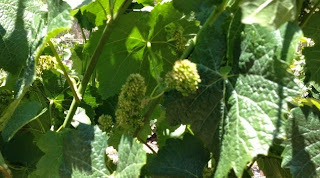 Depending on temperatures, 40–80 days after bud break the process of flowering begins with small flower clusters appearing on the tips of the young shoots looking like buttons. Flowering occurs when average daily temperatures stay between 15–20 °C (59–68 °F). 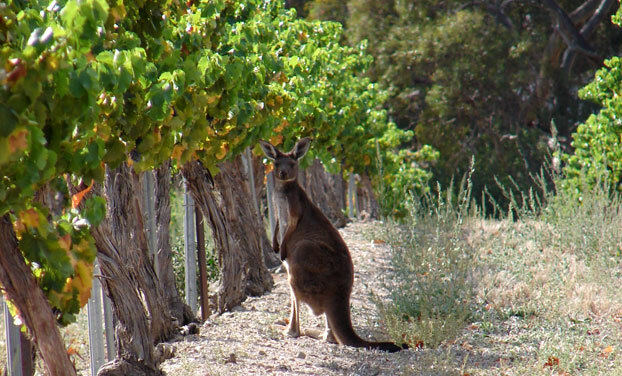 We sometimes imagine we can see the vines actually grow! This great growth creates a lot of work in and around the vineyard, including weed cultivation and shoot thinning. The shoot thinning is done by hand, and is like a post pruning. Once the shoots are a few inches long, Mark can begin walking the vine rows to make sure they’re developing well and also to look for signs of disease or nutrient deficiencies. With every pass through the vineyard there is shoot tucking and leaf pulling as well as general observation of the health of the vines. This continues almost daily throughout the growing season. Once spring is in full swing one of the worries is the weather. Too much rain, high winds or excess heat can impair pollination and or set. In the SLH region rain fall typically ends in April and these dry spring conditions help to promote a good “fruit set”. The largest challenges to set in the SLH are the very high winds that roar down the valley every afternoon. These ocean winds keep the appellation very cool and a great spot for growing Pinot Noir, Chardonnay and Syrah. But these fierce winds can lead to a “poor set”. Once the crop is set the numbers of clusters are counted. Yes this again requires someone in the vineyard actually counting each cluster (bunch) of grapes. Of course, there’s not much that can be done about too few, but if you count more clusters than is believed to allow them to ripen properly, then the excess clusters are dropped to the ground right then and there. Again a lot of hand TLC. 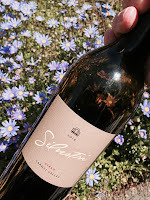 To help show you what we clumsily just tried to explain watch this video we took while talking to Mark Pisoni in the actual SLH vineyards. Thanks to Mark Pisoni for indulging us and being a great sport. We look forward to visiting Mark in the vineyards again to check on the progress. Maybe around veraison. What do you think? What can one do on a #WW in Monterey? We recently experienced Tarpy’s Roadhouse Wine Down Wednesday. 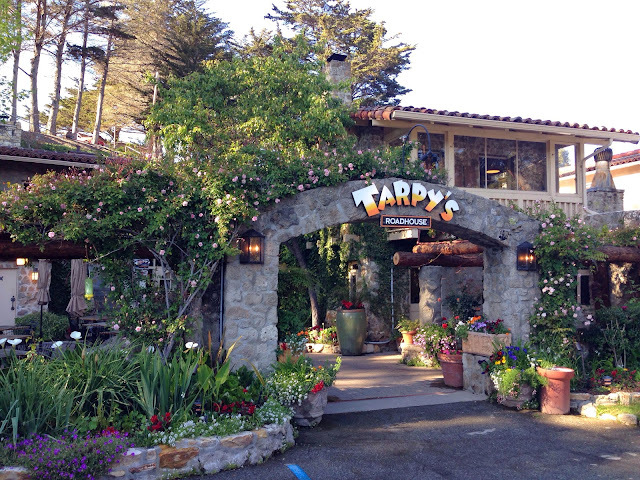 Tarpy's Road House is located on Hwy 68 just a few miles inland from Monterey. The night we were there we had the pleasure of tasting with Joullian Vineyards and there were only three simple rules for the day: Sip, Savour & Celebrate Wine. 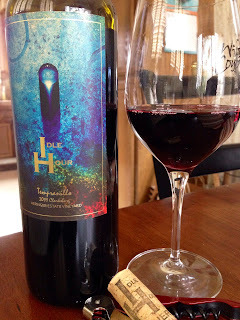 Each week there is a different winery pouring. 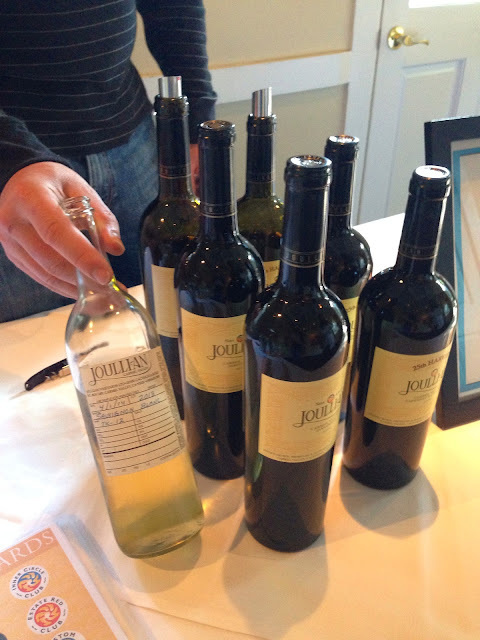 Joullian offered tastes of their wine and Tarpy's offers those same wines at half-price by the glass and by the bottle. Hal from Joullian even brought along some 2013 Family Reserve Sauvignon Blanc before it had been bottled (right from the tank, very nice). Additionally, dinner specials of the day compliment that week's featured wines making for a great dining experience. Guests there can also enter a monthly drawing to have a chance to win a dinner for two at Tarpy's and a basket of wine! 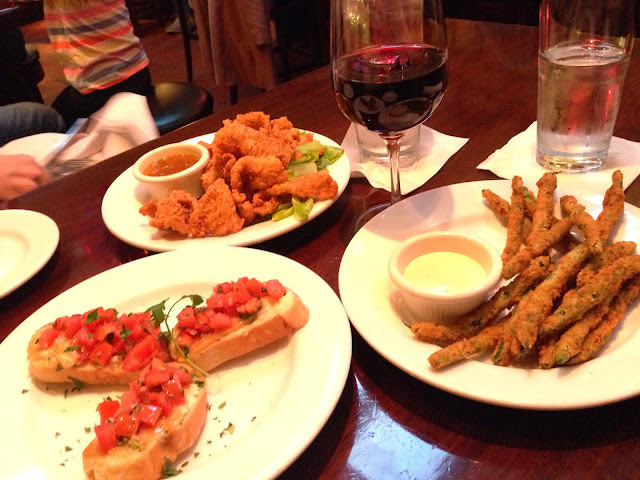 Its not just about the wine as the $3 and $5 tasty bits selections at the bar are great. Oh, and by the way the Sauvignon Blanc was fantastic, so head on over to the Joullian Tasting room in Carmel Valley and taste their wares. This is a fantastic local event that happens every Wednesday from 5-7pm. Get on over and enjoy the wine, the food and the company. 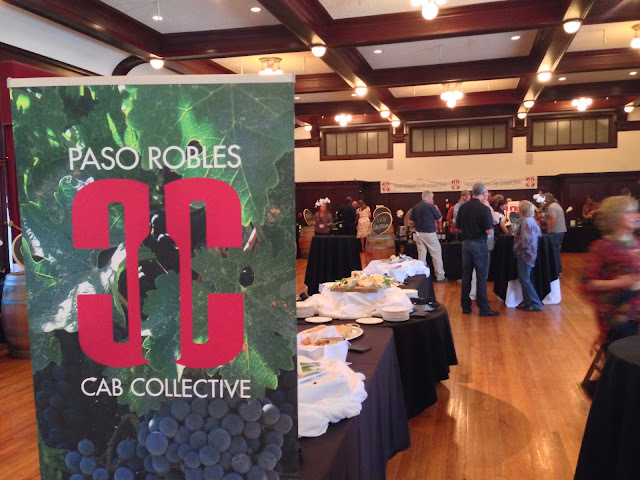 Paso Robles CABs of Distinction, was hosted by the Paso Robles CAB Collective (PRCC) from April 23 to 26 2014. The Cab Collective wineries from the area organized the event to host wine professionals, industry, media and consumers the last week of April in an effort to inform and educate about Paso Robles most widespread wine variety and arguably to put the region on the wine map in the first place. Visitors to the Paso Robles wine region might be surprised (although they shouldn't be) to learn that Cabernet Sauvignon and Bordeaux varieties make up 55% of the acreage planted to wine grapes in the Paso Robles AVA. 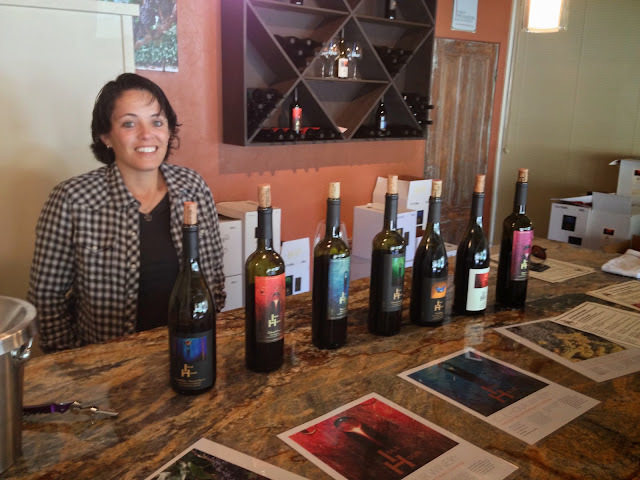 Paso Robles has in recent years been celebrated for its Zinfandel and Rhône wines, with The Rhône Rangers as an organization really getting Paso wines on the map and in the press. However, Cabernet was there at the start. As much as we are big fans of these wines, it really was the Bordeaux wine Cabernet Sauvignon that was there at the beginning that started the wine party. We were now there to get the low down on what this young organization was up to to put Paso Robles Cabernet and Bordeaux's back on top. Formed in 2012, the Paso Robles CAB (Cabernet and Bordeaux) Collective strives to promote the full potential of the Paso Robles AVA in producing superior quality, classic and age-worthy Cabernet and Bordeaux varietals to consumers worldwide. 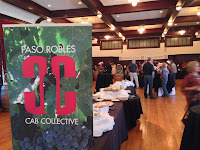 The PRCC seeks to improve awareness regarding the distinctive attributes of Paso Robles Cabernet and red Bordeaux varietals through events, education and initiatives that confirm the appellation’s growing reputation for producing luscious, well-balanced Bordeaux wines that compete with like varietals on a global stage. By collaborating and sharing they plan to raise the bar across the AVA for Bordeaux varietals from site, vines, winemaking, production and marketing. 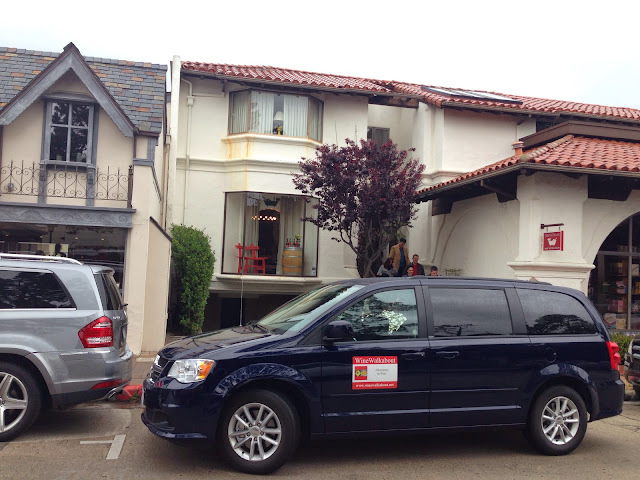 This year we attended the Cabs of Distinction media day on Thursday the 24th of April 2014 in the beautiful Ballroom of the Paso Robles Inn for the "Paso Robles Rises to the Global Stage" panel discussion. 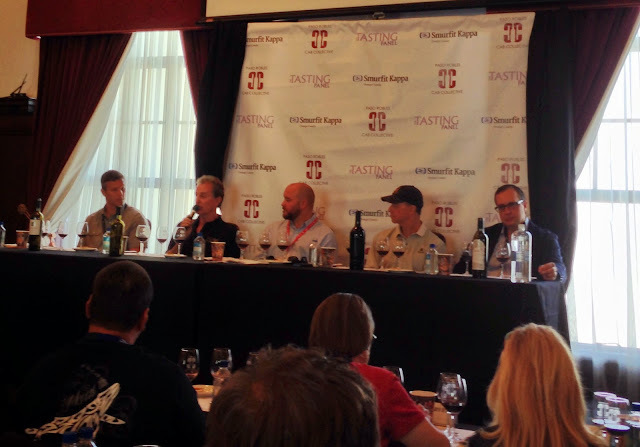 The discussion was moderated by Matt Kettmann, senior editor at the Santa Barbara Independent and contributing editor for Wine Enthusiast. He engaged and prompted four Paso Robles winemaker / owners to tell their perspectives on this, the most noble grape. The panel was made up of DAOU Vineyards & Winery Winemaker/owner Daniel Daou, Chateau Margene Winemaker/owner Michael Mooney, Halter Ranch Winemaker Kevin Sass, and Parrish Family Vineyard Winemaker/owner David Parrish. 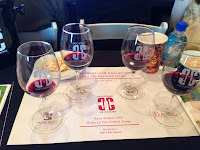 But wait, we did not just get to listen to them, they also provided a tasting of each of their wineries more recent best Cabernet Sauvignon (nice). The panel discussed issues of water, soil, root stock, vine clones, trellising, shoot thinning and canopy management as well as barrel selections and yeasts. It was informative, interesting and well done, and tasting some great Cab while listening was a big bonus. The discussion found a nice balance of detailed information and entertainment without us or any others resorting to eye rolling boredom. Truly well done! After the morning session it was off to a hosted lunch at various locations. 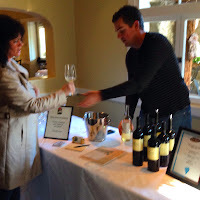 We were lucky enough to attend with winemaker / owner Ted Plemmons of Cass Vineyard and Winery. We enjoyed the comforts of the Cass Winery and had a great lunch. We ordered our meals off the restaurant menu, all the while discussing wine and vineyard questions and opinions with Ted and as a group. Oh, and we drank a little wine as well. Lunch ranged from Crab cakes to salads, steak sandwich's, pulled pork and hamburgers from Ted's own beef. Quite the selection that the winery restaurant produced in no short order and in great style. Nobody left hungry or unhappy. After lunch Ted led us all on a tour of the facilities and then it was into the vineyard for some Q&A. Ted was a knowledgeable and entertaining host and we had a blast hanging out with him at the winery. 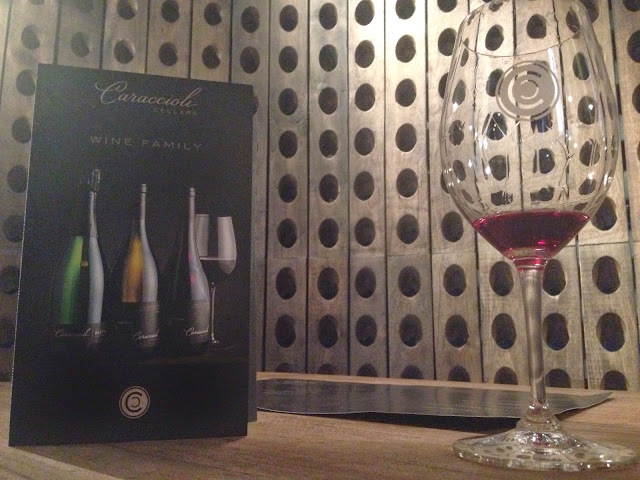 Can't wait to go back for a full tour and taste and to get more on the Cass Vineyards story (and Ted's as well). We were then transported back to town via the comfortable Uncorked Wine Tours bus for the afternoon tasting of The Cabs of Distinction, again in the beautiful Ballroom of the Paso Robles Inn. This tasting could easily have been an all day event with the number of high quality wines being poured. 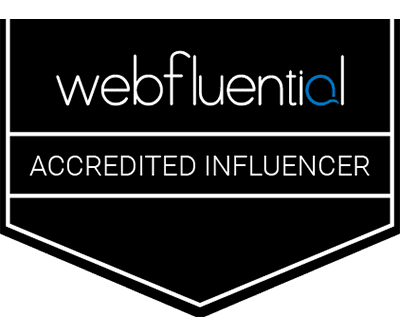 (member wineries here). We also enjoyed talking with a lot of owners and winemakers while tasting their wines, which is always a little more enlightening. This was a tasting of good to great wines and a reminder of just how amazing Paso Robles Cabernet can be. 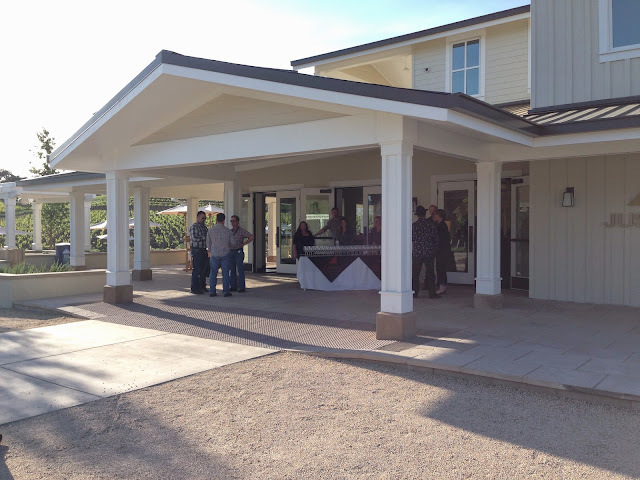 The day was not yet done as then it was off to Justin Vineyards for a pork BBQ dinner and social mingle with most of those that had attended the days activities. This was a lovely way to to get some nice social time with new friends from the day (including owners and winemakers) and an interesting study on what they chose to drink. 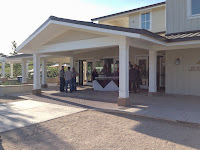 We also got to see the newly refurbished tasting room and it was lovely. 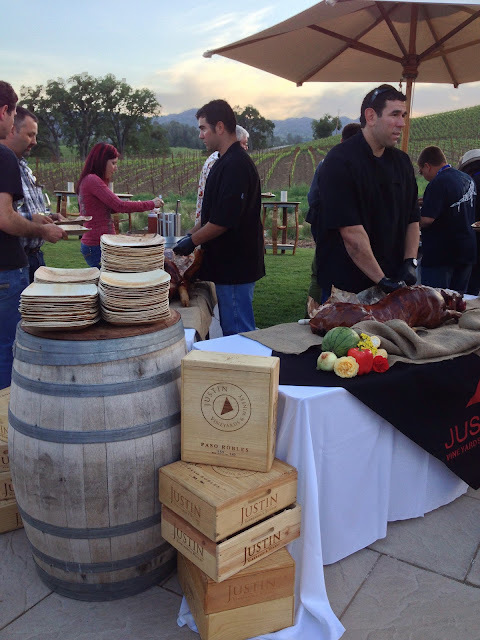 A great evening thanks to the crew at Justin Vineyards. Paso Robles has almost since the beginning produced some world class Bordeaux, but with this group of driven people pushing the bar up across the AVA, the area is about to rewrite the awards books.